Car bookings for the Show ‘n’ Shine will open on Tuesday 30th October, 2018. These instructions MUST be read IN FULL prior to entering the online booking system. Even if you have used Eventbrite before, our maps have been designed specifically for this event and these instructions will ensure a smooth checkout process. Please ensure to use a desktop computer to book your tickets and use Google Chrome as your web browser. Tablet, iPad, iPhone & smart phone bookings are not supported. Navigate to the Zone booking that you wish to book your car space/s. IMPORTANT: Do NOT enter any values from the dropdown box under Quantity. 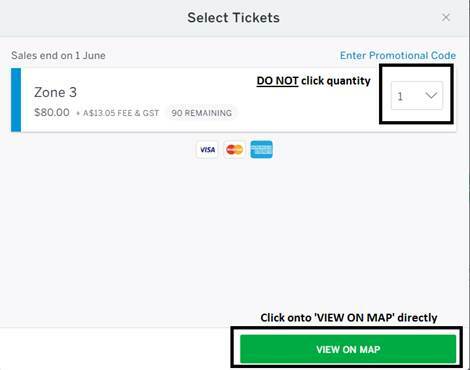 Click straight on the button that says ‘Get Seats’ to access the Zone booking map. If you do not follow this instruction you will receive an ERROR message and you will not be able to proceed. Upon clicking ‘Get Seats’, the Zone map will load. Press OK. PLEASE NOTE: Once you are inside the Map, the Booking Timeout period will commence. You will have 8:00 minutes to choose your seats and proceed to the Checkout. Once the map is displayed on screen, zoom in using your mouse scroll, or using the navigational tools on the bottom left hand side of the map. You can move around the map using your mouse to ‘Click and Drag’, and find your desired car space/s. Hover over your desired car space/s to display the price. Select your desired car space/s by clicking on the coloured circle that corresponds to the number of the car space/s you wish to book. Once you have selected your car space/s in your Zone, check you have the correct spaces and select the green button ‘Checkout’. PLEASE NOTE A BOOKING TIME RESTRICTION APPLIES TO THIS SECTION. You MUST complete the checkout within the allocated time, which in total will be 22:00 minutes (including browsing time in the map area). After the time expires, the car space/s you are reserving will be released back to others. Enter your own details under the Ticket Buyer section. Enter your Credit Card details under the Payment section. The system accepts Visa, MasterCard and American Express. Enter your details under Billing information. Proceed to enter the details of the Car Entrants you are booking for, under each Ticket number, which correlates to each car space you are booking. It is highly recommended that you have this information for each car entrant already prepared before proceeding to the Checkout. If you are entering multiple cars for the same person, you will have the option to copy this information from the previous fields so you do not have to enter it again manually. Simply click on the ‘Copy data from’ drop down menu and select the ticket you would like to copy the information from. Please note that all individual car make and model plus registration numbers will need to be added to each car booking in the space provided. If you do not have the registration number for each individual car at the time of booking, please select the ‘I don’t have my registration number’ option in the drop down menu. You will be able to complete the booking without the registration details, however you will need to complete this information prior to the festival. If your car will not be registered for the Festival, please select the option from the drop down menu and leave the registration number space blank. Once you have completed all the sections, select the green button ‘Pay Now’. After you have completed your booking you can update your registration at any time by logging back into your account and editing the ticket information. Please Click Here for information for transferring an entry.